^ Stein, M. Aurel. 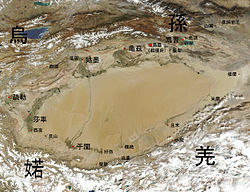 Ancient Khotan. Oxford: Clarendon Press. 1907. ^ Charles Higham. Encyclopedia of Ancient Asian Civilizations. Facts on File. 2004: 143. ISBN 0-8160-4640-9. ^ Archaeological GIS and Oasis Geography in the Tarim Basin. The Silk Road Foundation Newsletter. [2007-07-21]. （原始内容存档于2007-09-27）. ^ The Sakan Language. The Linguist. [2007-08-02]. ^ Jan Romgard. Questions of Ancient Human Settlements in Xinjiang and the Early Silk Road Trade, with an Overview of the Silk Road Research Institutions and Scholars in Beijing, Gansu, and Xinjiang (PDF). Sino-Platonic Papers. 2008, (185): 40. （原始内容 (PDF)存档于2012-02-06）. ^ 专家称大量壁画人物显示古于阗人乃东、西方"王子"后裔. 凤凰网. 2011-11-18 [2018-11-16]. ^ Mukerjee, Radhakamal. The flowering of Indian art: the growth and spread of a civilization. Asia Pub. House. 1964年. ^ Jan Romgard. Questions of Ancient Human Settlements in Xinjiang and the Early Silk Road Trade, with an Overview of the Silk Road Research Institutions and Scholars in Beijing, Gansu, and Xinjiang (PDF). Sino-Platonic Papers. 2008年, (185): 第40页. （原始内容 (PDF)存档于2012-02-06）. ^ 神秘消失的古国（九）：于阗. 浩学历史网. 浩学历史网. 2008-01-22 [2016-01-14]. ^ E. Yarshater (编). 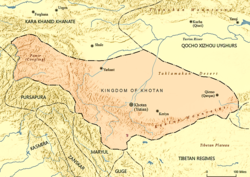 Chapter 7, The Iranian Settlements to the East of the Pamirs. The Cambridge History of Iran. Cambridge University Press. 1983-04-14: 271. ISBN 978-0521200929. ^ Valerie Hansen. The Silk Road: A New History. Oxford University Press. 2012-10-11: 227–228. ISBN 978-0-19-515931-8. ^ Johan Elverskog. 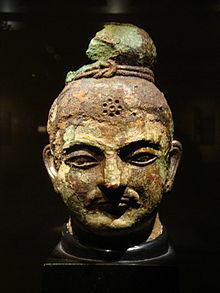 Buddhism and Islam on the Silk Road. University of Pennsylvania Press. 2010: 95. ISBN 978-0-8122-4237-9. ^ 30.0 30.1 Latham, Ronald. 马可波罗游记. 1958: 80. ^ Wood, Frances. The Silk Road: two thousand years in the heart of Asia. 2002: 18. ISBN 9780520243408. ^ 夏鼐. 《夏鼐集<“和阗马钱”考>》. 中国社会科学出版社. 2008年7月1日. ISBN 9787500470472. ^ Ehsan Yar-Shater, William Bayne Fisher, The Cambridge history of Iran: The Seleucid, Parthian and Sasanian periods. Cambridge University Press, 1983, page 963.